It was not something I had planned for or anticipated. My family consisted of a husband and wife and three children, and then one day it crumbled. It didn’t happen suddenly. The seeds of sin and selfishness had cultivated deep roots that were undermining the foundation I desired so much to build. Having grown up with divorced parents, I wanted with my whole heart for my children to grow up with an intact family. The details of what transpired are deeply personal and not something to share in a public forum, but when the dust settled I was a single parent of two teenage girls and an eleven year old boy. It was through this painful experience I learned to trust the Lord in ways I never would have learned otherwise. I was living in southeast Texas, very far from home at the time and found it a priority to make my way back to my native West Virginia where I had a support system. Some of this support came with caveats attached that I would “have to put my children in school”. Other offers of help implied that I couldn’t let my children “sit around the house all day”. In that vulnerable position was when I heard biases about the decision to homeschool most acutely. Instead of discouraging me, these assertions pushed me forward and deepened my commitment to continue homeschooling. While everything was falling apart, it was our anchor. Persisting in the lifestyle of home education drew us closer together, kept us connected, and gave us a sense that some things in our lives could not be undermined by the evil known as divorce. I struggled with fear and uncertainty about my future and that of my children. I battled insecurities about meeting the varied needs of my three unique offspring. At first, I was pretty angry and that is something God has loved me through. It has not been an easy road for my children or myself. We have faced many difficulties along the way, but the Lord has been faithful. It was important to learn not to feel sorry for ourselves and to view our expectations of one another gently. I had to trust that in my weaknesses, He was made strong. Things didn’t always go as planned and I had to accept that my best was all I could do. There were times when we felt criticized, alone, isolated and misunderstood. 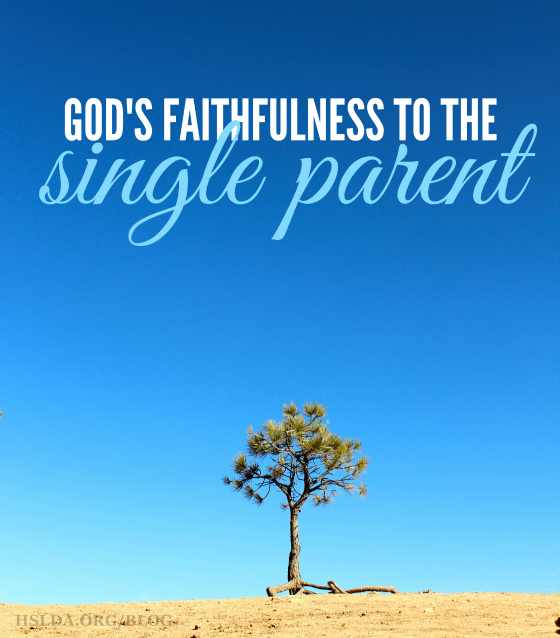 Time and time again, I have the opportunity to work with single parents who are facing the same kinds of things. I can look back now from a distance to that time in my life and thank the Lord that I am able to share with them God’s heart for the single parent. I have learned the thing that hurt me the very most in life is the thing He will use and is using for His glory. Photo Credit: Photo taken by Soumya Mupalla, graphic design by Charity Klicka.